I am enjoying a lazy morning in my pj's, laptop in hand, fireplace on and coffee nearby. School's closed today, so I get to be home with my girl today and that makes me smile! This works out great for her because she is still trying to get over her nasty cold/flu stuff, so the extra day off was welcome news. Mark on the other hand, had training today and had to travel a hour west of here on the icy roads. At least he's in his police car and not our car! Today I wanted to share my card from my recent GoDivas Swap round. This is my private swap group and can I just say that these gals are amazing?!! Just tremendous stampers and I'm honored that they choose to be in this group. It's no secret that I LOVE, LOVE the new Eat Chocolate stamp set - of course, they made it just for ME! So for my swap, I wanted to create my idea of a chocolate box. So tell me, what do you think? I used Brushed Gold Cardstock for the 'lid' and tried out the new Double Dry Embossing Technique with my Big Shot. I saw that technique a few weeks ago on someone's blog and knew it would be fabulous for this project. It's so EASY! All you do is take your cardstock and run it through the Big Shot with your choice of Embossing Folder - here I used the Finial Press folder for the first run through - then used the new Framed Tulips folder and ran it through a second time. You see the second folder's design more prominently which was exactly what I wanted for my Chocolate Box! Isn't that cool?!! Once I embossed the cardstock, I wrapped the corners with ribbon; Very Vanilla Satin and Early Espresso 1/8" Taffeta and then popped up the whole piece on Stampin' Dimensionals. The double bow was added afterwards. I used a combination of punches and Big Shot Circles for the layers. The image is simply stamped in Early Espresso ink on Very Vanilla cardstock. If you look really close, you can see the Crystal Effects on the piece of candy - it looks awesome in person! I added one of those fantastic Pearl Jewels and layered it all up with more Stampin' Dimensionals. I hope you all have a wonderful day today - I'm going to do some stamping and just enjoy my day with Emma. That's a winner in my book! Thanks for passing on that technique! I loved that card makes you think once you open it there will be a great box of chocolates inside! You did a fantastic job on stage! It is such a shame that your topic had to be covered but it was very informative and helpful. "Hand over the chocolate and nobody will get hurt..." Yep, that really does look like a chocolate box! When i saw that everything was covered with 1/2" of ice at 5:30 this morning, i decided to work from home today...took my dressy clothes off and got into jeans...i'll scrape the car after it's had a chance to warm up a bit. Enjoy your day with Emma! 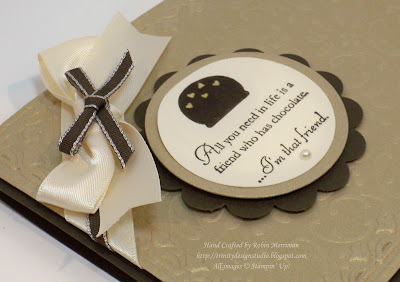 Just saw this on stampin connection and didn't even see who made it, just clicked on the link! And it so did not suprize me that it was YOU! You know I love your style Robin! Sweet card and I'm so going to case this for my club..and tell them all that YOU designed it of course! Fabulous card Robin! It really DOES look like a box of chocolates! Thanks for sharing. It sure looks like a box of chocolates...yummy. 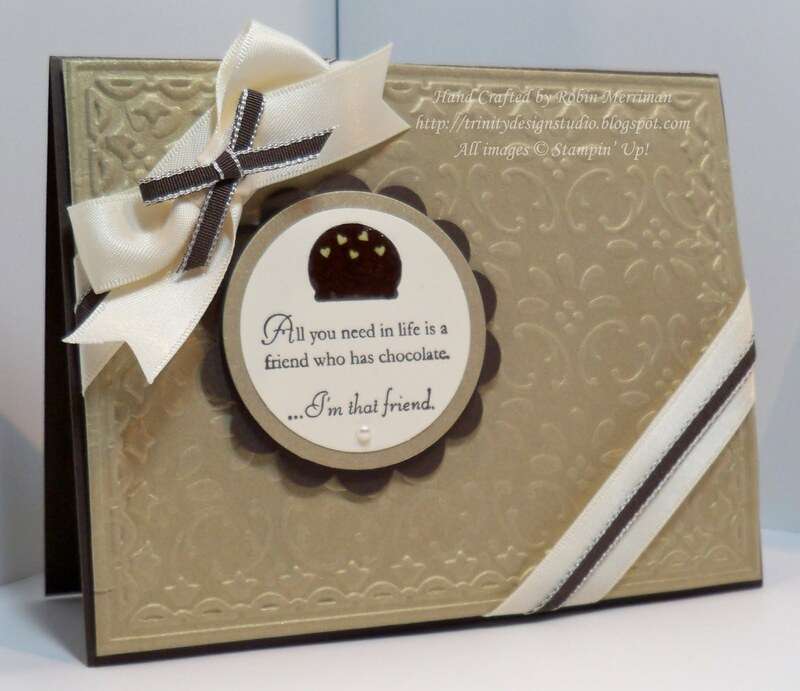 What a gorgeous card and I love that you used the brushed gold card stock. I love that stuff and it makes this card look like a million dollars!!!! Adorable card!! I love that it looks like a box of chocolates. Great technique to double emboss. I liked your card so much that I featured it as one of my Sunday Favorites. Thanks for the inspiration! What a great idea! Love the box of chocolate card. Thanks for sharing.